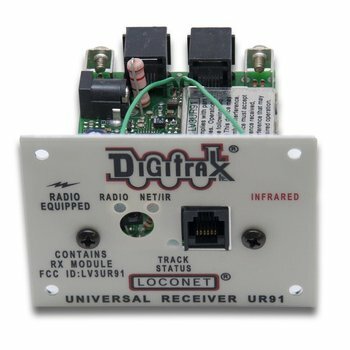 UR91 is the Simplex Radio/IR receiver front panel that lets you plug in to select your loco and unplug to run wirelessly with any Simplex Radio Equipped "R" throttle. Also equipped with an IR receiver the the UR91 also allows you to go wireless with your Digitrax InfraReady throttles. Simplex Radio "R" throttles and receivers available for use in U.S., Canada, Australia and New Zealand only. One RJ12 6 pin Throttle jacks in the front of the panel for hooking up throttles and other LocoNet devices that do not use RailSync.